Lian Shui Fluid-Spray - relaxes, warms and regenerates the muscles and stimulates Qi and blood. Lian Shui is quickly absorbed into the skin, bestowing a feeling of freshness. 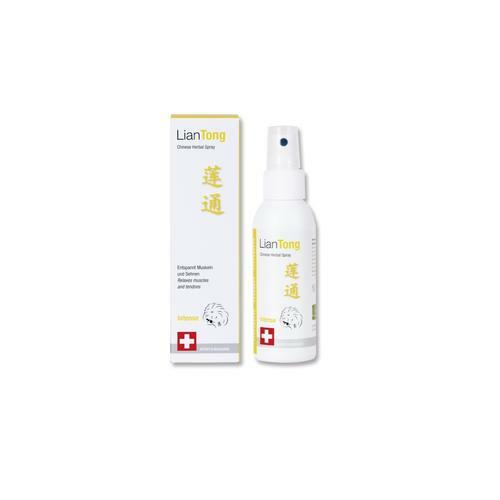 The combination of medicinal products in the Lian Shui muscle fluid activates Qi and blood, removes stagnation and stasis, has a slight warming effect and opens up the pathways. The muscle fluid can therefore be used for Qi and blood stagnation caused by traumatic injuries, contusions, bruises and muscle strains. It also relaxes the muscles and loosens up the members, and is perfectly suited as a liniment or a bath supplement. According to the Chinese tradition, a blockage of the free flow of Qi and blood are always behind trauma problems. This is why the blood-activating and stasisconverting group of herbs is the most frequently used, and forms the core of the Lian Shui herb composition. 100 ml.